This is the second part of a two part blog on Apple reliving the mistakes that Nokia made 4-5 years back. Read Part I here. Both Nokia (2007) and Apple (2012-13) were trying to time and control consumer preferences in terms of the features and the screen. Conversely, that was akin to letting the competition in thrugh the back door. Instead of creating the future by out-innovating on the feature roadmap – Both the companies were possibly trying to amass the cost benefits from standardized feature formats. The strongest parallel is how both companies started fighting the consumer preference for larger displays at the peak of their profitability… and then dug in as margins began eroding rapidly. Sample this: Phablets as a segment are already likely to make up more than 15% of smartphone market in 2013 – And Apple chooses to give this market a miss. At the peak of its prowess, Nokia executives talked about the performance trade-offs of big-screen phones: power consumption troubles plaguing big-screen phones; surveys showing that most consumers prefer smaller models. On and on and on, an endless stream of justifications and carefully constructed defenses, lecturing consumers about what they should want to buy. Do you see the pattern? Apple already has a well learnt lesson – the iPad Mini which was sacrilegious in terms of Steve Jobs’ definition of a tablet is the one that is holding the fort for Apple against the medium/low cost Androids. Has Apple hit the peak or is it a seasonal variation? Secondly, Apple’s smartphone market shares now seem to be on the wane with Androids from Samsung doing the pincer attack – both from the top end and the economy smartphones. As smartphone penetration moves from early adopters to mass-market and laggard consumer segments, the smartphone as a product will be less dependent on technical superiority, and more dependent on reliability and value – and it is Apple’s market to loose. (The gainers will mostly be the ZTE, Huawei and Alcatels of the world). As reported by Juniper, Samsung’s smartphone volumes are 2X that of Apple’s. AllianceBernstein predicts that Apple’s market share in smart phones will fall to about 12% this quarter, compared to 23% in the same quarter of 2012. 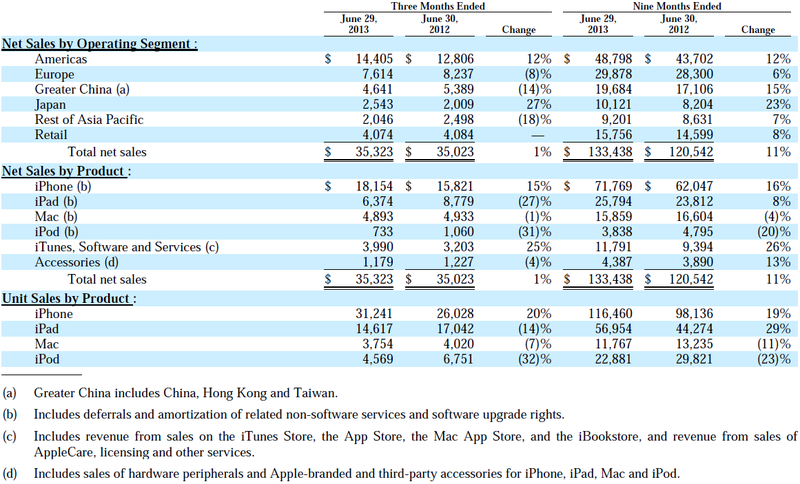 Further, the firm predicts that Apple’s market share may fall into single digits next quarter. IDC’s Q1 market shares also show Apple slowing down on its growth trajectory (YoY). Apple needs to look at the next evolution of iPhone – the mid level low cost iPhone. The iPhone 5S is already confirmed to be only an incremental over the iPhone5 – and is not going to incite mass hysteria as iPhones normally have done. A low cost iPhone could also be critical for Apple especially because ABI estimates the low cost smartphone market will more than triple, in devices sold, between now and 2018 whereas the mid-range will grow at only (roughly) 50%. For the present, Apple and Tim Cook look to be in a denial state – which is further going to bleed Apple. The high margin strategy is a great things for share holders – but then market presence and numbers is quite another thing. For the love of Apple, I hope it doesn’t going the Nokia way. Addendum 2: A further validation of loss of Apple’s grip in the smartphones segment is Apple’s declining profit share of the global smartphone industry. 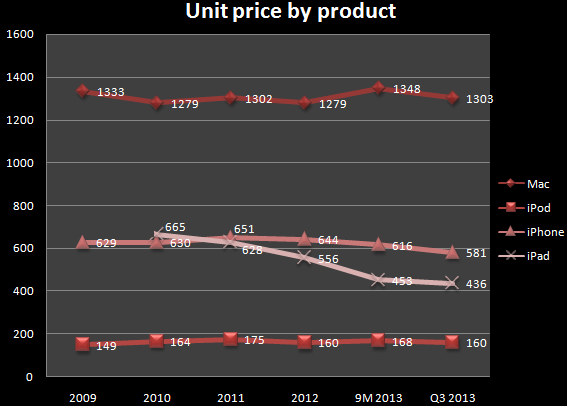 Between Q1,2012 and Q1, 2013, Apple’s profit shares of the global smartphone industry declined from 74% to 57%. Will Apple be a victim of its own success? In June 1984, Apple share price was a piddly $1.84. That was when Apple was under attack from Microsoft and Apple machines were being given a miss by the consumer community at large. Today Apple trades at $601.10. 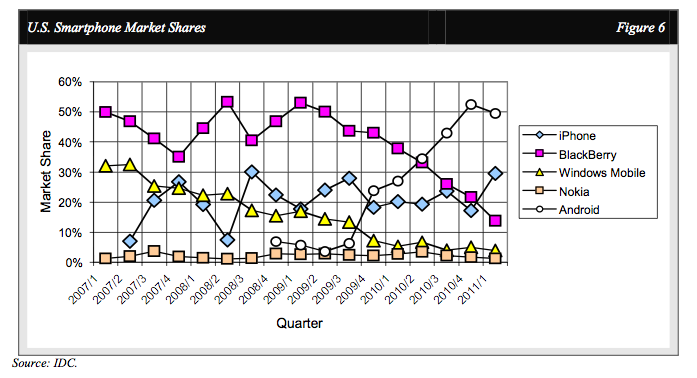 Apple’s stock price has appreciated at a CAGR of 23% ever since. Frankly now, that statistic isn’t wowing. So here’s something to wow … post the announcement/launch of the iconic iPhone 5 years back, Apple’s share price has registered 48% CAGR. 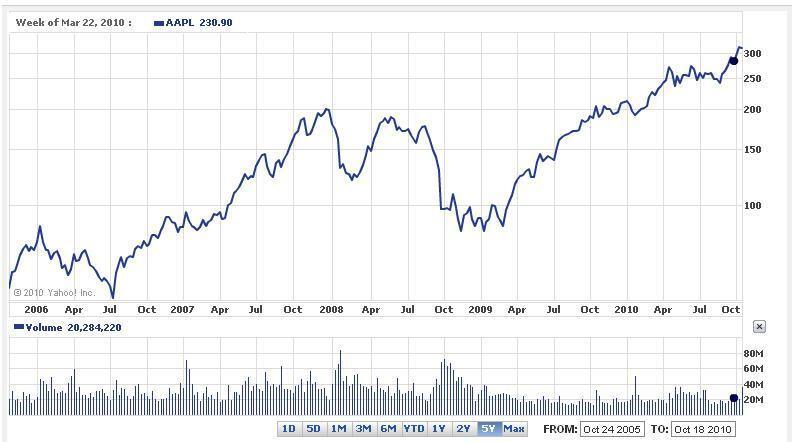 Ever since the iPad was announced in January 2010, the share price of Apple has zoomed 71% Y-o-Y. And for the nay-sayers, the share price of Apple has gone from $351 to $601 since the death of Steve Jobs.In an earlier post, i had written about Apple’s valuation being higher than the combined valuation of Google and Microsoft combined. In response to Michael Dell’s comment of selling Apple and paying its shareholders back, Apple could buy Dell thrice over with its loose change. 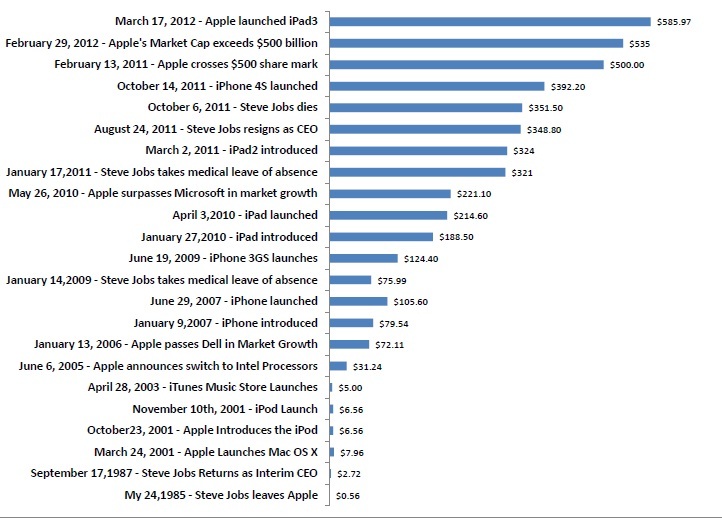 Apple could well be on its way to become a $trillion company (as predicted by MSNBC). If that were to be anytime soon, Apple would be the 16th largest economy in the world (If it were a country). Currently it is ranked 19th at par with Switzerland (IMF estimates) as the 19th biggest economy in the world (If it were a country). If I were to tally Apple revenue’s against the GDP of all the countries in the world, Apple would be equal to GDP of the bottom 105 countries put together. Try this with the CIA factbook data of GDP of world nations. Not withstanding the $100bn cash reserves that Apple holds. Selling it as fast as they come: Five years ago, it took Apple 74 days to build — and sell — the first 1 million iPhones. Last year, for the launch of the iPhone 4S, the company was able to supply 4 million units for the first weekend and build more than 24 million within the first three months. Last Friday, at least 3 million new iPads were ready for sale in 10 countries, with more on their way to 25 additional countries this coming Friday. Meanwhile, Apple is still building iPhones and iPods by the millions. Apple is on such a winning course because it’s encapsulated all of its different big products in the famed/infamous “walled garden”. Apple devices work together so well because of the tight integration of the devices, services and experiences across a variety of use cases. 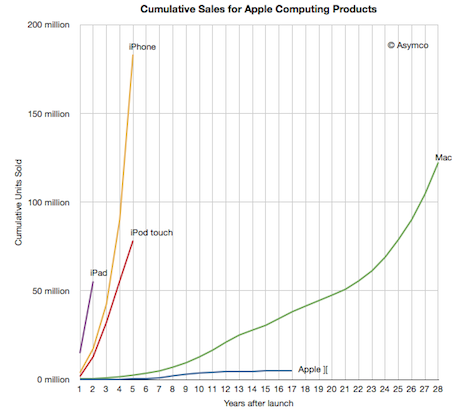 However, the question that begs to be asked is how will Apple replicate its success year on year, product after product. Steve Jobs had been immensely successful at building a robust platform (iTunes, Apps Store, iCloud) and then creating device led experiences that were unparalleled amongst the contemporary others. Currently, the biggest challenge for Tim Cook remains to sustain this momentum. Currently it was iPhone4S and iPad which have been instrumental in pushing the Apple share price by 50% in less than 6 months. Sustaining the craziness and momentum is a formidable challenge and Apple will need to out innovate and out-do the customer experience. Currently the only major new innovation due from Apple is the ITV. The iTV has some formidable base with Apple’s support services. One can expect Apple to perfect the device experience yet again. However, I have this feeling that Apple could be a victim of its own heady success. Apple has set the bar too high and outdoing itself year on year comprehensively is a feat that will be quite impossible. Then again, we speak of Apple here…. Why iPhone will blunt the Android surge? There are now over 500,000 Android devices activated every day, and it’s growing at 4.4% w/w: Andy Rubin on Twitter. 500K devices everyday or 1.5million a month, which ever way you see it, the number is certainly a very large one. That Android has its own issues in maintaining the sanctity of the platform is another thing all-together. Blackberry and Nokia need to be worried, very worried, because these numbers dont augur well for them. It means that a lot of BB and Nokia probables are slipping into Android and none of them really have an answer to the Android juggernaut. However, the one platform and Device that stands to disrupt Android incredible growth is the Apple iPhone and here is how the iPhone could turn tables on Android. 1. iPhone 5 is supposed to be released this September and will be 4G compatible. More importantly, Apple is launching the iPhone5 as a world phone for both GSM and CDMA platforms.That is going to be massive traction for the iPhone.Apple is never going to make dozens of devices to match Android in “choice”, but the carrier part of the equation is being negated. 2. Another rumor suggested, that the iPhone 5 will feature a SIM card slot for other countries except US. This will allow users to insert any SIM card in iPhone when traveling abroad. 3. Apple may be launching a low-cost iPhone along with its iPhone 5 to boost its presence in emerging markets.This could be the big volume clincher. A $349 price point for the iPhone could be a table turner given that Price is the most important factor in smartphone purchase decisions (read survey here). 4. The iPhone5 is also rumored to spec up both on Camera (8MP?) and battery life… both critical parameters. 5. Apple has also won a significant patent for capacitive touchscreens on touchphones. Apple could therefore potentially force competitors to licence their patent. This does place the onus on rival manufacturers to prove their device is not mimicking Apple. 7. The Verison CDMA iPhone sold 2.2 million units in its first quarter. Simultaneously Market agencies Nielsen and Needham-IDC reported that Android’s surge in US markets was flattening.Q1 2011 data show that while iPhone gained 12.3 percentage points to 29.5% US market share, Android’s share in the U.S. fell from 52.4% to 49.5% — its first sequential loss in any region of the world since early 2009. The seven factors put together give iPhone5 a lot of power to take the wind out of sails of the Android Juggernaut. Just how it pans out, we would wait and watch! The bad thing about being a marketer is that sometimes you could be stuck up in your previous glory days for ever and your marketing campaigns are wasted on key elements and features that fail to reflect market realities. Nokia’s latest salvo at iPhone is called the iDoalotmore is scripted on these lines. Symbian seriously is on its last legs as a smartphone platform of any reckoning and interest as well as sales is rapidly rapidly eroding from the platform. Therefore, there is a hint of ridicule when Nokia takes on the iPhone with its latest iDoalotmore campaign. This campaign was launched a day after iPhone4 was launched in India. Poking fun and snubbing the iPhone with a limited set of feature enhancements is NOT A GREAT MARKETING STRATEGY! Nokia goes to the extent of using the “i” in highlighting the feature lists. Interestingly, the campaign exhorts the Symbian platform which by Elop’s own volition is a burning platform. Is it me, or is there little sense in Nokia trying to ape and bully down the iPhone? One is reminded of how Nokia tactical trying to block pout sales of iPhone 2 in 2008 by launching the N96 even before it was ripe. The campaign actually worked but in the long term, Nokia got ridiculed trying to match a smartphone with a featurephone. It didnot work for Nokia and N96 is history now. 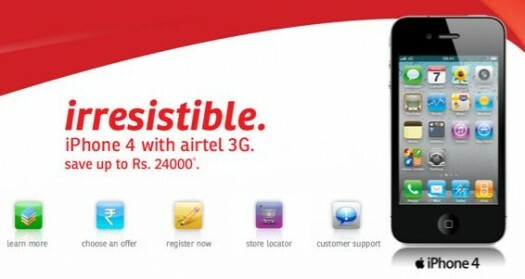 While Nokia tries hard to impress,iPhone4 just has one word for itself: irresistible! That is Subliminal! Period. 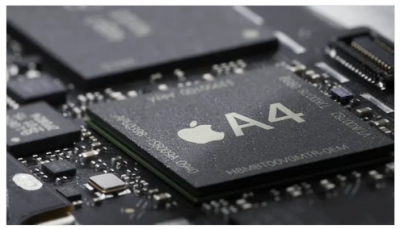 Apple moves in with Qualcomm for Chipsets for A5 processors! We have all heard about Verizon iPhone 4 launch this February. What this does to competition is a point in debate. 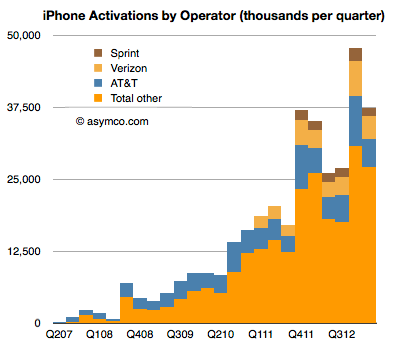 I had stated that the Verizon deal will leap frog Apple over the Android-RIM lead positions. Canalys on the other hand predicts that iPhone Verizon will not really derail the Android Juggernaut. Verizon iPhone 4 will be using a Qualcomm chipset for its CDMA radio (with no GSM capabilities) as opposed to the Infineon versions seen in the GSM iPhone 4. This isn’t much of a surprise by itself, but it paves the way for a major shift from Apple. Come April and we will see the thinner, sleeker tablet will sport a new screen technology that is akin to (though not the same as) the iPhone 4’s Retina Display and will be “super high resolution”. The device will remain at 10 inches but will now feature both front and rear cameras (not a huge surprise), and… there’s an SD slot. However, whats more interesting is the stuff under the hood. The new iPad will feature a dual GSM / CDMA chipset produced by Qualcomm and will mark Apple’s shift away from Infineon as its chipset maker to Qualcomm for all of its mobile devices. It’s not clear if the chipset being used will be based on the company’s EV-DO / HSPA Gobi variety or an entirely new design. Presumably, the strength of the new dual-mode chipset is that it will allow both Verizon and AT&T to offer the iPad simultaneously. Come mid 2011,and the iPhone 5 will feature a Qualcomm chipset that does triple duty as the CDMA / GSM / UMTS baseband processor. Apple is also at work on the second generation of its redesigned Apple TV, which will include that new A5 processor. It’s likely that the A5 will make it into the iPad 2 as well. This then is complete move away from Infineon to Qualcomm that’s truly notable — marking one of the biggest shifts in suppliers and technology since the advent of the original iPhone. The US telecoms are a study becuase the trends established in US are largely cascaded around globally. Android gets ahead of iPhone.Verizon-iPhone deal may to cut celebrations short. Applications rule! In a recent report summarizing usages of mobiles and mobile Oss over a 3 month period (SON 2010), comScore has ranked Samsung as the top OEM and RIM as the top smartphone OS in US. Samsung ended up 0.9 percentage points from the three month period ending in August. LG ranked second with 20.9 percent share, followed by Motorola (17.0 percent), RIM (8.8 percent) and Nokia (7.2 percent). After several months of strong growth, Google Android captured the #2 ranking among smartphone platforms in November with 26.0 percent of U.S. smartphone subscribers. Apple accounted for 25.0 percent of smartphone subscribers (up 0.8 percentage points), followed by Microsoft with 9.0 percent and Palm with 3.9 percent. However, Android’s happiness may be shortlived because of yesterday’s announcement about the Verizon-Apple tie up to sell the iPhone on the Verizon network 10th February 2011 onwards. Given that Apple’s 25% of the OS share is only its AT&T number, the Verizon tie-up would be significant in terms of a quantum increase in Apple’s numbers. It is very possible that the Verizon tie up and shipments may have Apple leap-frog both Android and RIM to be the number 1 OS in US. Given Android’s progression month on month the one loser here would be RIM who have steadily been loosing gas on market share. 67.1 percent of U.S. mobile subscribers used text messaging on their mobile device, up 0.5 percentage points versus the prior three month period, while browsers were used by 35.3 percent of U.S. mobile subscribers (up 0.8 percentage points). Subscribers who used downloaded applications comprised 33.4 percent of the mobile audience, representing an increase of 1.1 percentage points. Accessing of social networking sites or blogs increased 1.0 percentage points, representing 23.5 percent of mobile subscribers. Playing games attracted 22.6 percent of the mobile audience while listening to music attracted 15.0 percent. The interesting thing to note in these figures is that App usage actually could actually be significantly higher in terms of games on the smartphone, social networking site/blog access and use of downloaded app. While comScore isn’t vocal about the app contribution to these numbers, I suspect that apps usage would be around 50% or more users. In the early 1980s, the Macintosh faced an onslaught of competition from an army of PC makers whose products ran Microsoft software. The fight did not end well for Apple. In a few years, Microsoft all but sidelined Apple, and the company almost went out of business. Can Apple, which insists on tight control of its devices, win in an intensely competitive market against rivals that are openly licensing their software to scores of companies? It faces that challenge not only in phones, but also in the market for tablet computers, where the iPad is about to take on a similar set of rivals. For Apple which has lived the part of the bitter PC history, the stakes are huge, as the mobile computing market could prove to be larger than the PC market ever was. Having a tightly controlled ecosystem, which is what Apple has, is a large short-term advantage and a large long-term disadvantage. 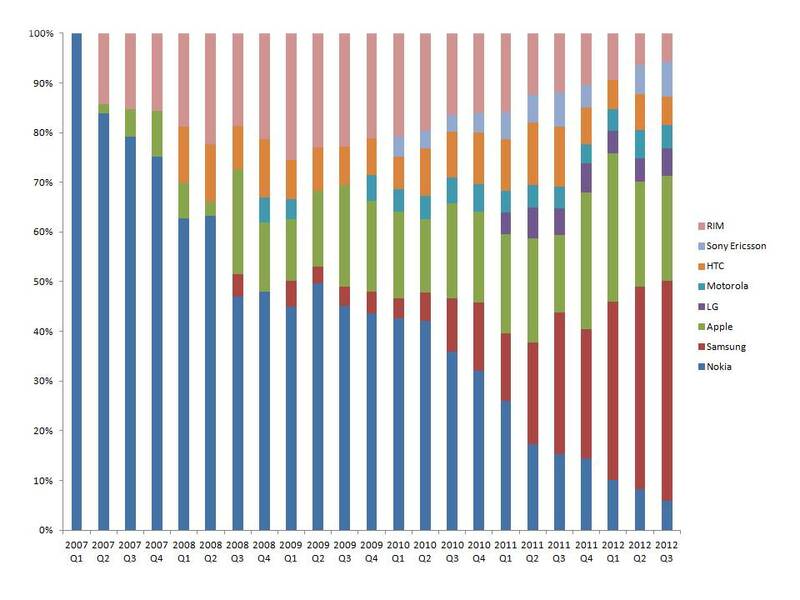 The competition this time is more formidable: Android, Windows Mobile, Blackberry and (even) Nokia. For now, the smart phone market is growing so rapidly that the rise of Android has not necessarily been at the expense of the iPhone. That will change as the market matures. Apple’s stock has soared nearly 50 percent this year, and touched all-time high of $314.74. But the rise of Android has been both sudden and unexpected, and its ascent highlights some of the advantages of an open approach. There is much more rapid innovation taking place in an open environment. For every new version of the iPhone, Android has 20 odd smartphones ready to challenge Apple’s leadership mantle. That leaves little room for error at Apple. The company must continue to create hit products, as a single misstep could give Android and other rivals an opportunity to make inroads and steal market share. Also, as the number of people with Android phones grows, Android will grow more attractive for app developers. For now, Apple’s App Store, with more than 250,000 applications, enjoys a large advantage over the Android Market, which has about 80,000. And those numbers don’t tell the whole story. Apps made for the iPhone tend to be of better quality, are more frequently downloaded and on average are more profitable for developers. But that edge may not last, especially as many developers fret about Apple’s tight control over the App Store. What’s more, the iPhone isn’t really fighting alone. The two other devices that run Apple’s iOS mobile software, the iPad and the iPod Touch, further strengthen the iPhone, because consumers like being able to access the content and applications they bought on iTunes and the App Store on multiple devices. Apple has sold more than 120 million iOS devices. And while Apple’s personal computers were by and large technically superior to Microsoft-based PCs, they were also far more expensive. In the smart phone market, carriers, who play a vital role in distribution, have been willing to subsidize the iPhone so that its cost to consumers is roughly the same as that of comparable Android phones. Bottomline: Apple may lose its overall leadership, but maintain a share of the market that could easily be in the 25 percent to 30 percent range at a very profitable level. Even that is enough to sustain a very large and very profitable business. Apple and the Superman act! Apple reported a profit jump of 70% from last year, driven by strong sales of Macintosh computers, iPhones and iPad multimedia devices. This has taken the analysts by surprise who had underpitched on the numbers. The reported net income for the fourth quarter of $4.31 billion or $4.64 per share, compared to $2.53 billion or $2.77 per share for the year-ago quarter. Gross margin for the fourth quarter fell to 36.9% from 41.8% in the prior year quarter, while operating margin for the quarter decreased to 26.8% from 30.1% a year earlier.Net sales for the quarter rose 67% to a record $20.34 billion from $12.21 billion in the same quarter last year. International sales accounted for 57% of the quarter’s revenue. iPhone sales of 14.1 million were up 91 percent year-over-year, handily beating the 12.1 million phones RIM sold in their most recent quarter. Apple sold 3.89 million Macintosh computers during the fourth quarter, up 27% from the year-ago quarter. Apple sold 4.19 million iPads during the fourth quarter, which however, trailed estimates of some analysts who were expecting the company to sell about 4.8 million iPads during the quarter. 1. Apple is looking to increase its distribution and tieing up with operators such as Verizon will only increase momentum of its iPhone sales. 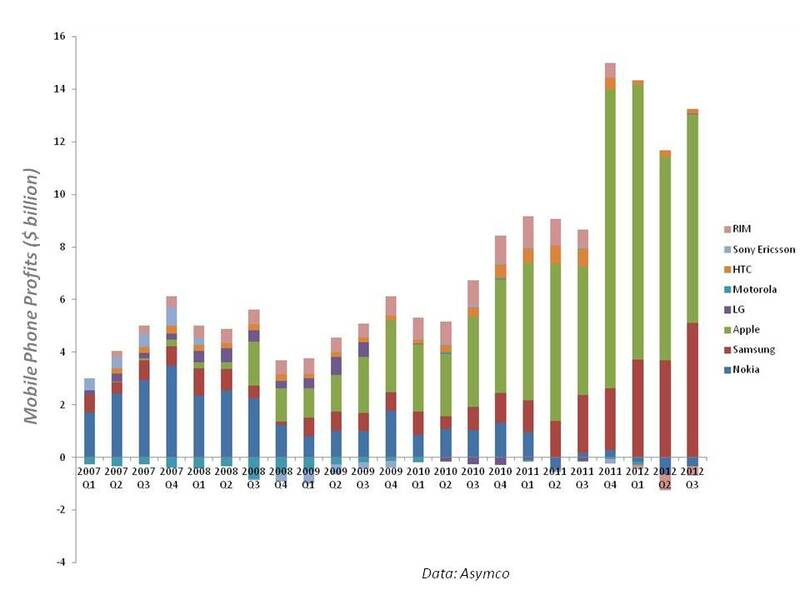 Already the iPhone is eating into a disproportionate share of the global smartphone profits. 2. Apple is building huge economies of scale across its iPhone, iPad and iPod and this helps keeping its costs low. 3. 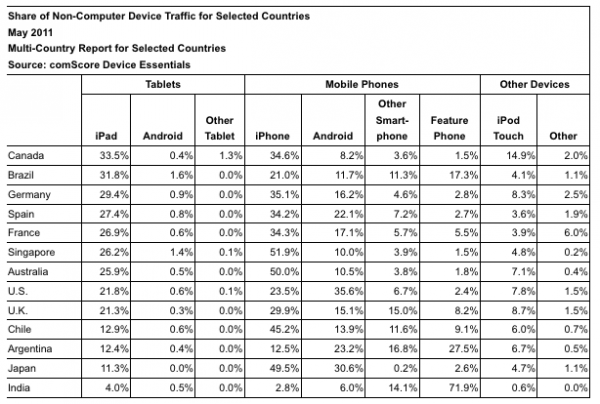 Apple is also able to drive consumer usage across various products. However they have kept the platform constant and its 120 million iOS users are a definite lot who keep coming back for more. 4.	iPhone drives data traffic and that is sweet music to carriers who are willing to subsidize Apple products so that the user cost is roughly comparable to Android devices. 5. While Apple TV is taking its first steps, the Apple TV along with the iPhone (for smart computing), iPad (The cross between Laptops and Smartphones),iTunes, Music Streaming, Application Store, iOS, iPods (Multimedia devices), Mac Computers are beginning to forge a media network eco-system which fortifies the Apple Media, Web and Mobile proposition in a unique manner. Come to think of it no other competitor comes close to matching Apple’s scale across these range of devices and solutions. 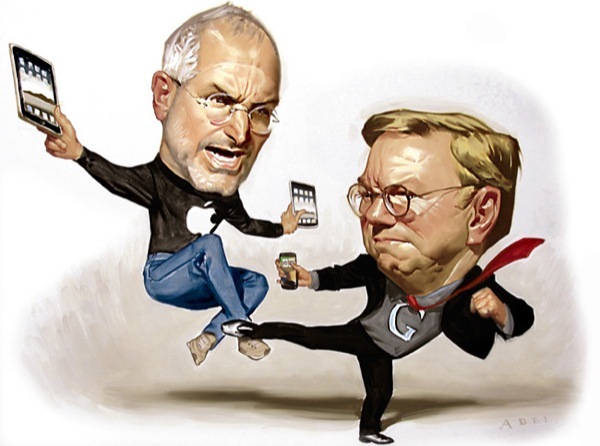 However the question that nags is while the “Walled garden” approach has yielded great results for Apple, will it be enough to fight the “Open Source” juggernaut. 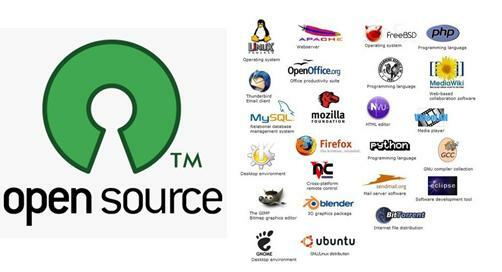 Will Individual brilliance continue to overshine the Collective Enterprise-Open Source (Read Google). Sooner or later Apple will be at crossroads to question its Strategic imperatives and Organization philosophy.